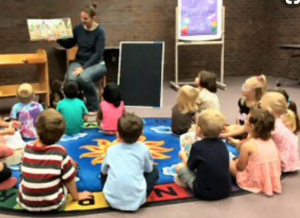 Pre-school Storytime is a half hour of books and activities for children ages three, four and five. Tuesdays at Gere & Walt at 10:30-11:00; and Eiseley at 7:00 pm- 7:30 pm. TALES AND RHYMES at Walt Branch 11:00-11:30 am Incorporates folktales, fairy tales and nursery rhymes into a story time setting All ages welcome. FAMILY STORYTIME The whole family is welcome to enjoy crafts and story time. Tuesdays: South Branch at 6:30-7:30 pm. Bennett Martin at 6:30-7:00.